Biscuits and Gravy is a delicious and favorite breakfast. And let me tell you- my mom’s biscuits and gravy is one of THEE BEST! Let me be honest here- I am not a sausage person by any means. Anyone that knows me knows that that statement couldn’t be truer. That being said, I can’t get enough of my mother’s Country Sausage Gravy. That should speak volumes of it. I love to load it on top of our family biscuit recipe. It makes for a filling and delicious breakfast that the whole family loves! If you haven’t tried Biscuits and Gravy for breakfast, you are missing out. And if you have (or haven’t) you absolutely HAVE to give this recipe a try! You will be so happy that you did and it will quickly become a new family favorite! This recipe is absolutely divine! A perfect filling breakfast that is full of flavor and the whole family will love! Cook sausage, drain and set aside. In a medium size saucepan melt the butter over medium heat and then add the flour and cook for 1 minute. Add the milk, and crumble the bouillon cubes between your fingers into the sauce. Stir until thickened. Add sausage back to gravy. Add salt and pepper to taste. Cut biscuits in half and pour gravy over the top. Probably shouldn't admit to this, but I could literally eat this every day. Wishing I had some right now, love it! Made these! You were right these biscuts and gravey are the best! You never, ever put chicken bullion in sausage gravy. This is why any breakfast gravy made outside of the south tastes horrible. Leave out the chicken bullion and season to taste with salt and freshly ground black pepper and this might be a passable gravy recipe. Thank You! I'm from Southern California, and we NEVER add chicken bouillon to sausage gravy - that's sacrilegious. Not to mention the added salt! I just changed the flour to gluten free so I can enjoy it once in a while. Can't deny ourselves every pleasure! I have traveled in my job, mostly in the Midwest but some in the south. I have had good and bad food where ever I went. There are some phenomenal cooks in the south......... and in the north. No section of the country has the best food/cooks. I think I make pretty good sausage gravy and biscuits, but I will agree with you that the bouillon cubes seem out of place, I don't use them. When I make sausage gravy I cook the crumbled sausage in a pan and add a little cooking oil to the sausage ( pork is leaner than it used to be), add butter, add the flour, cook for a few minutes then add milk (preferably warmed in the microwave) and stir until it is done. Oh yeah. and season with salt and pepper to your liking. I like a lot of pepper. BTW, I am getting lazy in my old age. I have begun making a biscuit mix. ( dry ingredients plus cut in the shortening/butter) and keep it in the fridge. Then when I want biscuits I just scoop out some of the mix, add buttermilk, mix it up as usual and bake. Saves me some time when I am in a hurry. I agree!! Leave out the chicken bouillon!!! I make sausage gravy and you do NOT need the chicken bouillon!! Amen! Leave out the bouillon! The sausage will flavor it plenty! Amen to that! Never add chicken bullion! That is just nasty. Confession: I have never had biscuits and gravy because they've never appealed to me. But these look really yummy! Plus, my husband loves biscuits and gravy, so I think I might have to try this recipe this weekend. Thanks for sharing! You can also use this gravy on egg noodles. Add some sour cream at the very end and you have what my mom called poor mans stroganoff. Great recipe!!!! Butter in it is good but also bacon grease if you have it. I am not from the south, but you people who are worried about the chicken boullion in this recipe really should try it before you knock it. I actually made this gravey just as the recipe suggested and they were the best biscuts and gravey I have every had!!!! I personally think the boullion is the secret ingredinet. Good point. We should try it before we criticize it. Yeah. Must be a Yankee. Who spells gravy with an "e". Leave out the chicken. Umm, am I missing something? At what point does the sausage come back in? Oops! Step 2 at the end the browned sausage is added. Then season to your taste. It's a simple recipe you can make any time without having to get specialty ingredients. Try it - you'll like it. Love this recipe, but prefer not to use msg what can I use instead of the bullion cubes? Your recipes look so yummy! I can't wait to try your Mom's bisquits and gravy and your twix brownies!! Thank you canning jarsery much for sharing your recipes! Hi Nikki, I made this for brunch along with your biscuit recipe and they were both very delicious. I've decided that it is my new favorite sausage gravy and biscuits recipe. I will be making this often on Sundays for the family :) Thank you so very much for sharing !! This is really, really, really, REALLY AWESOME!!! I would recommend using unsalted butter. This has now ruined all future restaurant visits for my family! Only homemade from now on! Thank you for sharing this recipe! Added half of a bullion cube this morning and was still delicious!!! My family are all from Southwest VA. My Mamaw made sausage gravy every morning. She would fry the sausage until nice and brown and then would take it out of the frying pan and add flour to the grease and lightly brown the flour in the grease. She would then add what she called "sweet milk" or just plain ol milk to the sizzling flour and stir until nice an smooth. Season with salt and pepper. Out of this world. My husband was from Walnut Ride, Arkansas...and he saved bacon dripping to make this milk gravy with.....it also add flavor....But sometime I use have butter and half bacon fat. LIving on a farm and ranch we made our own butter and we always salted it to give it flavor, I have to buy it now and I always buy salted butter....there not enought salt in it to hurt anything. Actually the chicken bouillion cube is a secret ingredient that can be added to many dishes...I always add it to my brown roux gravy that I make after frying chicken...my mother taught me that trick and it not nasty at all...it delisous.....I say cut down and use 1 and try it....just hold off on adding salt until you taste it. It really make a good differcents. My husband and I were on a mission to find the best Sausage Gravy recipe. We tried them all. Although this recipe is the standard, the one I use is far superior! All you do is exchange your milk to 3 cans evaporated milk and use Bob Evans sausage only. The smoothness and the flavor is greatly improved. The Canadian is wondering if Sausage refers to ground beef or actual sausages (pork, or beef ground up and squeezed into casings). My daughter loves bis/gravy... well i made my daughter your recipes n she does not want. I'm also a chef in training studying culinary arts and working in a cook's role for a major hospital cafe in Arkansas. While I'm a transplant to Arkansas I have come to like biscuits and country sausage gravy, but I have to admit that whether it is a white gravy or sausage gravy it's pretty bland although filling. I was hoping you might challenge the orthodoxy of sausage gravy and come up with something with a real twist on this staple. Starting with the basic ingredients -- sausage, there's a whole world of wonderful tasting sausage to explore beyond sage flavored American breakfast sausage. There different types of Chorizo Portuguese, Spanish, Mexican. Scottish bangers, Italian sausages, even Thai sausage that would add some zip. Even the gravy itself can be accentuated with more flavor other than black ground pepper. How about adding minced onion, red & green bell pepper, or pepper jack cheese, siracha, a small amount of chipotle in adobo sauce. I like the filling aspect of the gravy, but I like to entice people with a little depth and complexity of flavor that will compliment the eggs and bacon and hash browns. Gruyere cheese and a bit of wine as well would give more depth. American breakfasts are pretty boring to begin with. As one student to another of you get the opportunity travel to Italy, Spain, France, Portugal, UK, Germany and then hit Asia Singapore, Malaysia, Thailand, Hong Kong, Japan to explore the possibilities of enhancing your customers' culinary experience. I'm starting my professional culinary career after nearly 30 years of International business and travel abroad. Take the ordinary and make it extraordinary! I want to make this for a football morning game...... How would I make enough for say 25/30 people? Im a huge cook by any means of the word, but I would really like to try it out. It sounds delicious! Would I just triple or quadruple the liquid intake? A response sooner then later would be greatly liked! :). Thanks again for the recipe. I was skeptical about the bouillon, having made many versions of sausage gravy and thinking this additon would lead to a salty, odd tasting gravy. 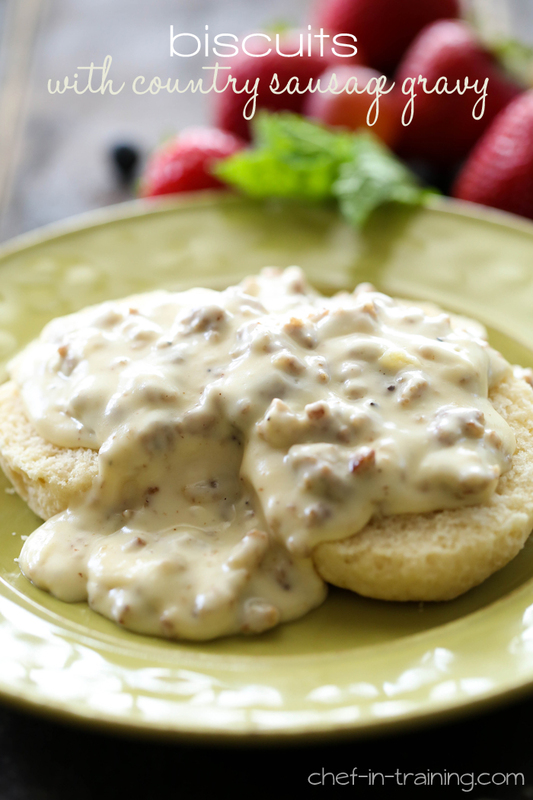 I have to say that this is the BEST recipe I've ever tried for sausage gravy ... The bouillon gives it a lovely depth of flavor. Please don't tell my Southern grannies!! OMG... As a New Englander, I never understood the concept of biscuits and gravy. I had envisioned using pan drippings and water, not butter and milk. Looking at the recipe I have new understanding... In NE we use "white Sauce" which is pretty much the same, less the bullion. Now I must learn to make biscuits! You don't need the butter. Add the flour to the mostly browned sausage. It binds to it and cooks it. Then add milk. I use some cream.